Hi there. Im new to this so please be kind. 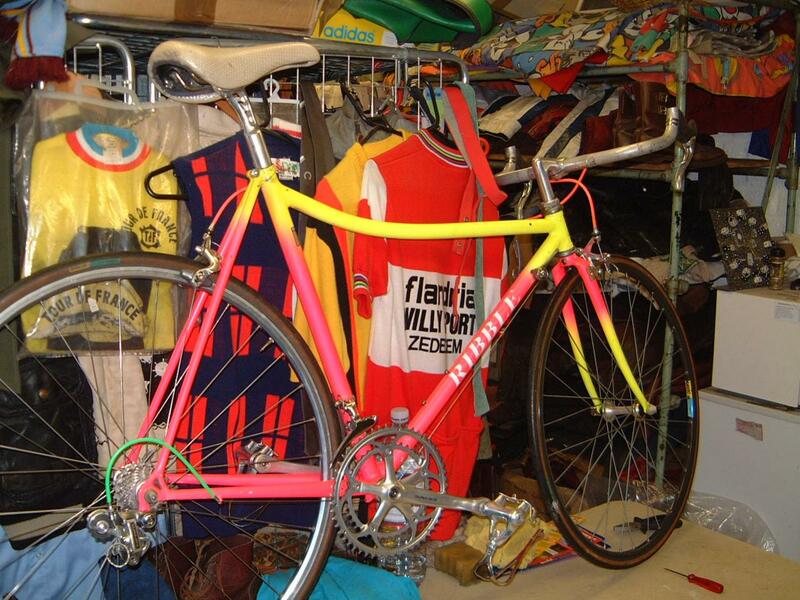 So ive just bought an old skool Ribble that takes me back to my youth. I haven't collected the bike yet but have uploaded some pics. Im trying to find out some info about it as im not sure of the steel used in i'ts construction as it has no frame stickers. It also has some Cinelli extras which im not sure were a standard thing with Ribble. The shop I bought it from had a regular who new a bit about Ribble bikes, as I bought it from Kirkham, Lancashire where the bikes were built for many years, and he suggested it looked like a Terry Dolan built bike and probably a Columbus frame. The other thing is it has a race plate hanger on the frame which I haven't seen before. If anybody has any info that might help I would really appreciate it. My intention is to ride it over the summer with a view to restoring over the winter. Last edited by monkey6464 on Thu Feb 19, 2015 2:26 pm, edited 2 times in total. I grew up in Preston & used to ogle the bikes when the shop was on Watery Lane. All the frames hung on the wall in the shop, all I could afford was the sachets of Isostar. Parents wouldn't entertain buying me one given the price. They built in both Reynolds & Columbus, the latter being less common. A stock 531c with 105 group was £550 in 1988 as I recall. Lad at school had one & we all looked on in awe as he used it for his school bike. Can't tell but those look like initials stamped into the bottom bracket? Could be custom build or a domestic team bike, although I don't know of any team that used Ribble. The only famous name I can think of is Boardman, he was sponsored by Ribble circa 1991. Hopefully others may have more info. Regardless, the older Ribbles where very nicely made and i'm sure you'll enjoy it. Doesn't look like it needs a great amount of work. Cheers Finney1973. I also used to visit the shop regularly and lust after the bikes. I did eventually own a second hand one but can't remember alot about it. I rode allot through my youth and teens, but was seduced into the mtb seen in my early twenties, buying a hard tail Ribble. I was nice enough, polished alluminium and pretty sweet for just knocking about on, but I never did really take to it. I sold it about 18months later and never bought another bike for a long time and really regret giving up the road scene. Hopefully when I collect it I might be able to find some numbers on the frame that might give some clues. The sticker positions and number of them doesn't appear to be the norm but I did come across a frame on google which had almost identical stickers which was described as a replica of the bikes built for the 92? olympics. I hope someone here will have some useful info. Thanks again for the reply, it's good to know that others have fond memories of Ribble as I do. Under rated in my opinion, but the mass produced tag of today's Ribble perhaps sways people's views. Dolan didn't do bad for himself though, implying that his (and others) who built for Ribble produced some decent stuff. The Barcelona 92 story as far as I know was that Ribble were down for the frame production, did make X amount but the UK Olympic committee had been working with Mike Burrows and Lotus. Those bikes were ridden, medals secured and zero exposure for Ribble. A lawsuit was considered for breach of contract, the legal bill was too much and would of sent Ribble to the wall, end of association. I think the bikes would have been white, but don't quote me on that. Ribble don't have records of frame numbers from the period (i've asked) but if it is initials on the BB then perhaps you will end up with a search on riders from the period. Thanks for the info. Hoping something on the frame my give some clues. Having spoken to Ribble and sending them some pics, they say that what I actually have is a Cinelli frame that someone has stickered as a Ribble. Im not convinced. Why would someone do that with a Cinelli frame. Could Ribble have used Cinelli components back then? They fobbed me off as well when I unsuccessfully researched a Ribble TT frame of the same era. Either there's nobody from BITD that still works there, or as they told me - they don't have any of the frame documents anymore? My thoughts exactly. What a shame Ribble either can't be bothered or don't have any archives. Surely a company like there's would be proud of their history and relish the fact that people were wanting to keep these old bikes alive. I can't work out whether to faithfully restore or just repaint and do my own thing. Whichever way I think it's a half decent frame. It's a completely different operation these days, I think they still own the building on Watery Lane, but it's a mail order operation on an industrial estate a couple of miles from my ma's house.